Chippendale, with its quaint, elegant form and carving, grows more valuable as the years roll on. In fact, it is difficult to gauge the worth of some specimens. Happy, indeed, are they who possess complete sets of Chippendale chairs, and wise in their generation are those who treasure them. Notwithstanding the beauty, shape, and simplicity of its outline, a Chippendale chair can be ruined, from an artistic point of view, by its seat. Six beautiful specimens, for which a dealer offered one hundred and fifty pounds to the owner, were made positively hideous and vulgar through having their seats covered with ornate embossed velvet. It perhaps cost a guinea a yard, but that is not the point; something which cost perhaps a twentieth of that amount per yard might easily have been more suitable. As it was, artistically speaking, the appearance of those beautiful treasures were ruined by the unsuitable choice for their coverings. Old world chintz is an admirable covering for a Chippendale chair; it suggests the correct period, the scent of lavender, the ringlets, and crinoline of the lady of fashion of that day. The things which can throw us into the atmosphere of the period to which the antique belonged, as it were, always seem to produce the best results. But the ideal seat for a Chippendale chair must of necessity be the one which is embroidered after the manner of old English embroidery. The charming result will well repay the embroideress for all the trouble she may take. It need not be a costly item; quite beautiful results may be obtained on a coarse linen in crewel wools, with silks for the high lights. The design reproduced is a charming example for one such embroidered seat. It is marvellous what wonderfully decorative results can be obtained from wools and silks on linens - rather a coarse linen for preference, of a fairly deep ivory or oatmeal tint. The actual seats of the chairs, which, as a rule, are removable, and easily slip in and out from the Chippendale frames, could be upholstered in holland. The outer embroidered cover could be so cut as to permit of its being slipped on over this, and fastened under the chair at the sides and at the corners with tape. The embroidered cover could also be tacked down all round underneath the seat. The advantage of this method is that, if it is a light fabric and the embroidery is delicate, it can so easily be removed for cleaning - or even washing. Each time these covers pay a visit to the cleaners or to "the tub" they look like new on their return. It is not difficult to cut out the material for such seats at home. Place the seat in the centre of the material, and draw its shape on to the fabric, allowing for turnings. The design can then be stamped on to this. It may either be worked in the hand, or in a frame, whichever method comes easiest to the embroideress. Very beautiful and uncommon is a design of orchids and mimosa, choosing pale yellow crewel wools for the latter, and soft shades of mauve for the orchids. The light which, in the natural flower, would possibly fall sharply on the tip of each petal is suggested by using pale mauve silk with touches of ivory. 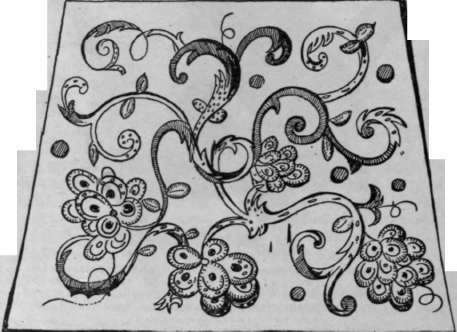 The petals of the flowers are worked in satin-stitch in a double row, in a slanting manner, whilst there is a veining in the centre of the petal in stem-stitch. This is worked in a dark but soft purple silk. The mimosa flowers are worked thickly in satin-stitch. The stems of the flowers are embroidered in chain-stitch in crewel wools, whilst the leaves are worked in satin-stitch in soft shades of green. When the embroidery is completed, this may be tacked firmly over the seat, upholstering it, or it may be removable in the manner already explained, the cover in this case being simply folded over the seat like an envelope, and secured into position by means of tackings or tape. To be continued.